The core of this collection is composed of works transferred from the department of the picture gallery of the Slovak Historical Museum from 1950 to 1953. 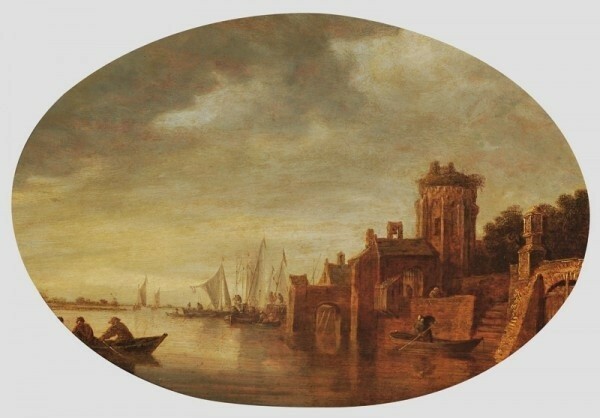 The majority of this set is constituted by the first class works of Italian masters and to a lesser extent by the works of Dutch and Holland masters. They come from the collections of the Pálffy family, which were kept in the chateaus in Kráľová pri Senci and Pezinok, and individual works from the estates of the Erdődy family in Hlohovec, the Stummer family in Továrniky, the Brunschwick family in Dolná Krupa and Raoul Kuffner in Sládkovičovo. In 1953, the nationalized works from the Chateau in Čakany were moved to the SNG building; in 1961 these works were transferred to the collections of this institution. The set contains the paintings of German and Austrian masters. Among them, we can identify fragments of significant collections, such as that of Adolf Kohner. The collection was markedly complemented by the works of various sources through the collecting of nationalized estates from individual national committees and various public institutions in the 1960s. A smaller portion of this collection from Central Europe was acquired through purchase at auction houses and lotteries in Berlin, Vienna, Budapest and Pressburg in the second half of the 19th century. Other works were acquired by artists Július Szentistvány in Vienna and Ján Fadrusz in Italy. Quite exceptionally, their later owners are also known, Prince Buckingham of Stowe, Marquis de Véri of Paris, Thomas François Granvell of Besançone and Cornelis van der Geest of Antwerp. According to today's knowledge, none of the works originated from the well-known collection of Habsburgs exhibited at the castle of Pressburg, part of them found their way to the free market in Budapest. 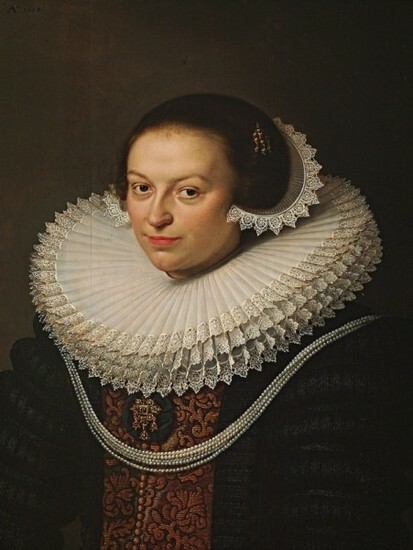 The creation of a separate collection of European art was not planned when the SNG was founded. Karel Šourek originally proposed a "study department of foreign historical schools." However, Karol Vaculík, the longtime director of the gallery, succeeded in creating the collection which today incorporates over 550 works, through systematic purchases in Czechoslovakia. Concerning new acquisitions, the curator's approach was decisive from the very beginning. Understandably, it was also determined by the accidental nature of availability and historical circumstances. However the final status reveals a striving for diversity in terms of geography, formality and meaning. The most extensive part of this Collection of European Painting constitutes of the works of the Italian, Dutch and Holland schools from the 15th to 18th centuries. From the historical point of view, less balanced collections are represented by the Flemish, French, English and Spanish schools from the 16th to 18th centuries. Baroque works prevail in the representation of all schools. In this spirit, the collection is implemented and geographically and chronologically classified, offering a picture of the transformation of the formal shape, various streams and significance, particularly from the 16th to 18th centuries. The works from the turn of the 16th century represent the most valuable part of the collection. The painting Carrying of the Cross by Hans von Aachen, which was purchased from an antique shop in Prague in 1958, is one of the rare expressions of delicate and sensual Mannerism. Prior to his service at the court of Roman-German Emperor Rudolf II, Aachen was a renowned artist in Munich. As a result of this purchase, the collections were enriched by a unique work from the early period of this artist. Although it was not transferred into graphic art work, almost ten period replicas by several masters document the very intensive reaction towards Carrying of the Cross, which was built on the contrasts of motions and subtle forms. Gillis Coignet (Congnet) the son of a goldsmith master, who trained at a workshop which besides others produced various measuring devices and astronomic apparatuses,undoubtedly acquired a principal education. The intellectual dimension well grasps the works that are non-traditionally signed Congnet invenit et fecit, i.e., thought of and depicted by. 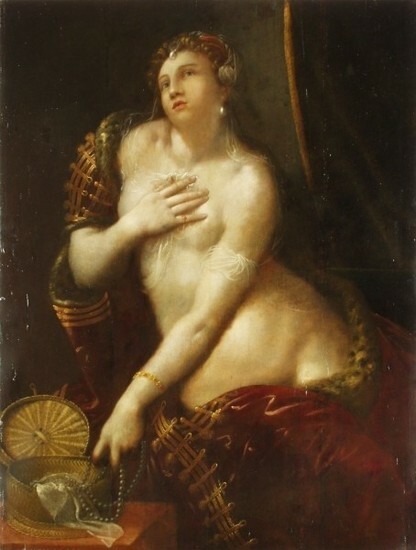 In the painting Mary Magdalena, he copes with the model that was provided to him by Titian's Venus at her Toilet. He reached out for a motif that anticipated the ancient sculpture Venus Pudica. The invention emphasized in the signature is related to the Christian interpretation of the ancient model. Cinquecento theoreticians gladly referred to the story of the painter Zeuxis, which offered the correct principle of imitation. According to this legend, the artist wanted to depict the most beautiful woman of the world, Helen, and therefore he picked six women. Nature overcome by idealizing and selection became the artistic principle. Francesco Vanni from the Sienna circle is the artist of the meditative Mary Magdalena and a multi-figural historical scene was captured by Andrea Vicentino from the Venice circle. Several paintings also originate from the Florence co-workers of Giorgio Vasari, the most significant theoretician and representative of Mannerist doctrine. The opinion swing in favour of realism determined the character of the approaching 17th century. Gradually it was accepted as an independent principle. Artistic innovation and the strong realism of Caravaggio connected with his dramatic chiaroscuro, determined the art of the 17th century. The painting of Caravaggio's follower and possibly model, Cecco del Caravaggio (Francesco Boneri) Carrying of the Cross is the welcome sensation of the collection. The strong light contrasts of individual figures before the flat, slightly accented background not only model, but particularly dramatize the scene. Subjectively connected figures form a parody; they are subordinated to a strange psychological depth. Giulio Cesare Procaccini was the first true anti-Reformation painter of Seicento in Milan. He was highly appreciated especially in church circles, and thus became a sought after painter of altar paintings. 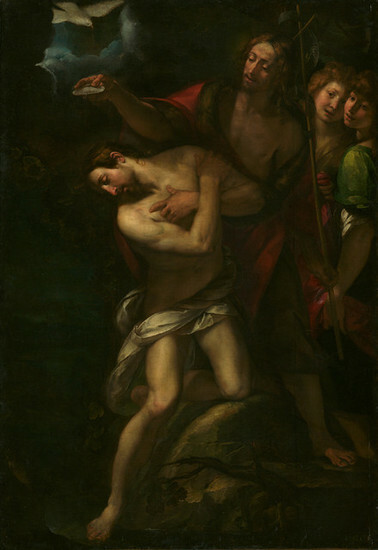 The Baptism of Christ is part of scattered cycle prepared most probably according to a commission of the Brotherhood of the Holy Cross for the Church of Santa Carlo. The emotionality due to the unusual usage of lights is simultaneously manifested as a new Baroque content with formal repercussions of Mannerism, such as elegant motions of figures and cold tonality of chromatic impasto. Caravaggio's influence also left traces on the work of the significant French painter Simon Vouet, who however strengthened the decorative aspect of expression. Still, the depiction concentrated on the pronounced moment of the story remained dominant. 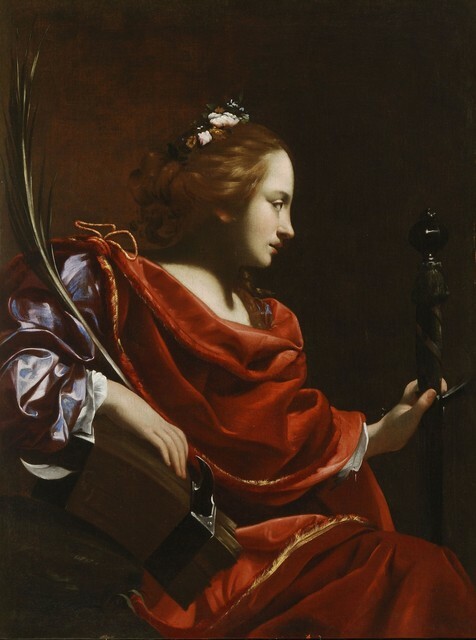 The face of Virginia Vezzi, Vouet's student and later his wife, is shown in the profile of St Catherine. The independence of the artistic style and expression of the Dutch provinces failed to overcome the influences imported from Italy. The representatives of realistic expression could peacefully draw even from domestic tradition and while consciously building on well-established methods. Both ways lead to a discovery of the means of true depiction, while oscillating between the descriptive and studied depiction of the same visible world. A number of excellent works document this phase. The sensual Four Elements by Hendrick van Balen and Jan Brueghel senior came from the famous Flemish artistic milieu of Antwerp, where it also became part of the collection of Cornelis van der Geest, one of the most important collections of that time. The outer decorative form of the elegantly cold pair of representative portraits of Gerrit Schaep, ambassador of the United Dutch Provinces and his wife Johanna Visscher by David Bailly, created in Amsterdam, is manifested in a completely different way.